It isn't often that one gets the opportunity to review a book - it's always an honor, especially when it is from an esteemed friend and colleague. Piotr Celebias's UFOs Over Poland: The Land of High Strangeness takes the reader through a journey across the landscape of a country we don't immediately associate with ufology or the paranormal. It is also true that our knowledge of the paranormal in Eastern Europe is limited to a few articles in Flying Saucer Review, Paul Stonehill's work on Soviet-era ufology, Jacques Vallée's "UFO Samisdat" about the Voronezh incident in Russia, and perhaps a few others. Readers can now delve into a book that spans centuries and covers the vast array of the unknown: UFOs, abductions, strange entities and the phenomena that are usually placed into the portmanteau category of high strangeness. 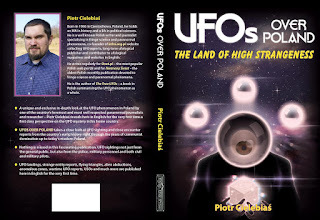 UFO researcher Philip Mantle's Flying Disk Press has made this achievement possible, and I urge anyone with an interest to go beyond repetitive cases (particularly one from the '40s)to acquire a copy of Piotr's book. You won't be disappointed.